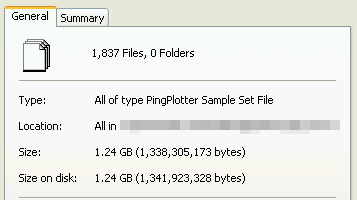 We’ve got a LOT of data–too much, almost–collected over the last month or so, all of it graphically viewable/displayable thanks to the magic that is PingPlotter Pro. We’ve literally been tracking and sampling data on our connection non-stop for the last month, and we will continue to do so until this is resolved. Some days there isn’t much to look at, because we’re probably out of town or otherwise not around or actively using the connection. Other times, like with any sustained download of any kind–regardless of OS, download protocol, machine, local network devices or configuration–it’s pure hell, riddled with cable modem reboots, Internet disconnects and packet-loss statistics that just aren’t acceptable, ever. We hope to have a post up soon–with lots of pretty pictures for Time-Warner Milwaukee / Roadrunner–that shows pretty clearly what a giant suckfest this has been and continues to be. It would be great to be able to post everything, but it’s just not practical. We’re quite willing to turn it all over to Time-Warner if they ever end up noticing and wanting it. We’re also quite willing to turn it over to the local media at this point, too. Enough is enough at some point, and we’re pretty sure we’re actually well beyond it. And in other ‘more of the same’ news, the approximately 100 feet of cable line lying, unburied, across our backyard on our lawn continues to lie there, since January…of 2007, making this Month Fifteen of that, too. Oh, and it didn’t fix a damn thing, either. For that matter, Time-Warner Milwaukee has no record the guy ever paid us a visit that day or did anything, and he was here for hours. It’s seriously like we don’t exist to anyone but the billing department. We’re going in tonight to discuss our bill with the local Time-Warner Milwaukee office. We’re not expecting much but more Missing Of The Point accompanied by additional Lack of Understanding of the Problem.